Taylor Perrodin is from Crowley, Louisiana. She attended Crowley High School where she served as FFA treasurer for two years and president for one year. She was also vice president of 4-H and Key Club and Student Body secretary. She was also a member of the National Honor Society and valedictorian of her class. As a member of FFA, she competed in Parliamentary Procedure for four years, Prepared Speaking for one year, Opening Ceremonies for three years, Land Evaluation for one year, Livestock Evaluation for one year, placed first in state in Dairy Cattle Evaluation, placed second in state in Nursery/Landscape, and placed fourth in state in Geaux Teach Ag. Aside from clubs and organizations, Taylor was a football trainer for one year, a member of the volleyball team for three years, played softball for one year, and was a cheerleader for two years where she served as co-captain during her junior year. Taylor is currently a freshman at Louisiana State University where she is majoring in environmental management systems as an honors student. She plans to attend graduate school and pursue a law degree to practice agricultural law. 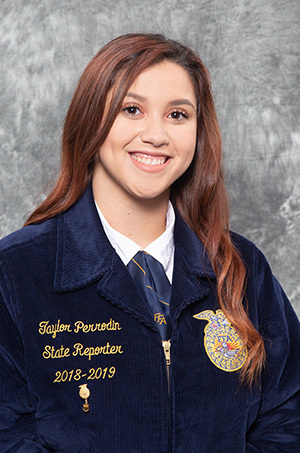 Taylor Perrodin is proud to serve as our 2018-2019 State FFA Reporter. Please contact the State Office or complete the online form found here. Copyright Louisiana FFA Association © 2019. All rights reserved.